CL-Out bioremediation reduced PCE concentrations in ground water by more than 99% in less than 90 days to achieve GCTL standards at a dry cleaners in Florida. The naturally aerobic aquifer conditions supported the aerobic cometabolism of PCE. It is observed at many sites that naturally aerobic conditions prevent the natural reduction of PCE and TCE. This is obvious when the suite of contaminants include high concentrations of PCE or TCE without daughter products. Instead of working against the natural conditions to drive the aquifer conditions anaerobic to facilitate reductive dechlorination, a more sustainable approach is to use CL-Out aerobic cometabolism to remove the parent compounds without producing daughter products. This approach has been used at hundreds of sites such as this example in Florida. Contact CL Solutions for more information about this approach. CL-Out bioremedation at a dry cleaners in Southern California reduced PCE concentrations in soil and ground water by 85% and 90%, respectively, to achieve site closure standards in less than 30 days. Keeping the site aerobic to eliminate the reductive dechlorination product vinyl chloride was critical to the rapid site closure. CL-Out bioremediation is by aerobic cometabolism, which breaks the carbon bond in PCE and TCE instead of converting the molecules to DCE and vinyl chloride. In order to maintain aerobic conditions during Cl-Out bioremediation, EHC-O, an oxygen supplement, was added during bioaugmentation. The rapid remediation facilitates property transfers and redevelopment without disruption to property use and the construction schedule. Cometabolism is considered the indirect beneficial destruction of a contaminant compound by a microorganism that is growing on another substrate. While the benefit may be fortuitous, cometabolism can be directed and controlled to improve the environmental benefit. CL Solutions has used cometabolism in three ways for bioremediation of different types of compounds. • CL-Out® is a consortium of microbes that cometabolize chlorinated solvents under aerobic to anoxic conditions. The microbes metabolize dextrose as a primary substrate and constituatively produce dioxygenase enzymes that convert PCE, TCE and other chlorinated aliphatic compounds into organic acids that are metabolized. • CL-Out® has been used to remove perchlorate from soil and ground water while growing on a substrate and using perchlorate for respiration. The substrate provides a carbon source and the perchlorate reduced by respiration. This approach can also be used for denitrification. • In a novel approach, a simple sugar can be used as a substrate to support microbial growth when the concentrations of the target contaminant are too low to support an effective population density. This approach was used for pesticide bioremediation when the ground water concentrations were less than 0.1 µg/L and the remediation goal was 0.002 µg/L. CL-Out® bioremediation has successfully remediated soil and ground water at many dry cleaner sites throughout the US and Canada. With our successful track record, we have learned that success depends as much on appropriate planning and field procedures as on a superior technology. Matching the right technology to the site conditions is a sustainable approach with the highest probability for success. CL-Out® bioremediation will remove PCE and all daughter products under aerobic conditions, while other technologies are limited to anaerobic conditions or just PCE and TCE removal. Just getting CL-Out® or any other agent in the ground is not enough. A good injection contractor using appropriate procedures can achieve completed and uniform distribution of the microbes to avoid rebound from untreated zones. Proper hydration before injection increases the population of CL-Out® as much as four times to give you the equivalent of four drums for the price of one. A high population of beneficial microbes increases the frequency of contact between cells and molecules of contamination. A combination of technologies can address changes in conditions across a site and over time. CL-Out® bioremediation is compatible with sve/air sparging, chemical treatment, and other traditional technologies. Petrox® bioremediation was used to remediate dieldrin and other pesticides at a site in Pensacola, Florida. The remediation progressed in stages including a bench-scale treatability study and field pilot study prior to full-scale remediation. The full-scale remediation is also staged to take full advantage of the benefits of each application of Petrox® bioremediation prior to the next application. 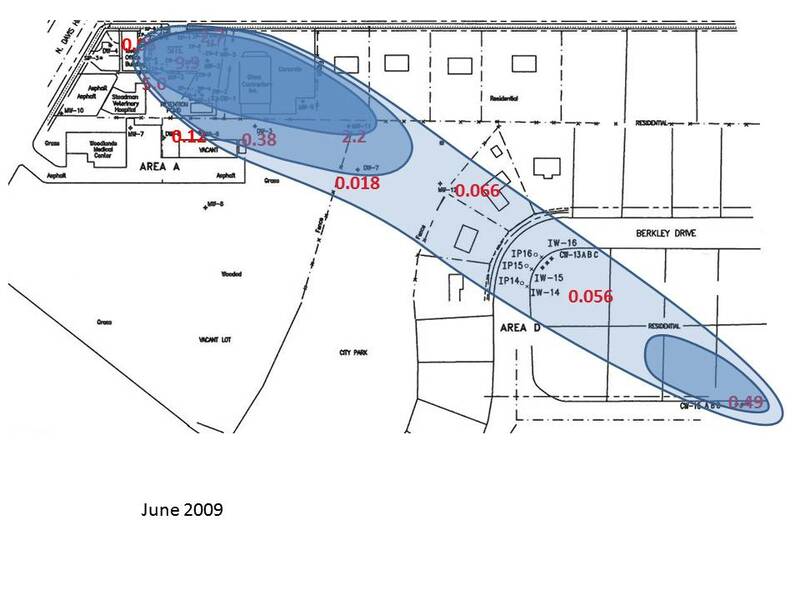 The remediation is in progress, but this case study reports the significant progress made in reducing the size of the impacted ground water plume and the contaminant concentrations. The site is located on coastal plain sediments. The sediments are fine to medium-grained quartz sand to approximately 40 feet deep, where a medium to coarse grained sand layer is encountered. The coarse-grained layer is approximately five feet thick. The coarse-grained layer overlies a fine to medium-grained sand layer with interbedded discontinuous clay lenses. The sediments form a thick, unconfined aquifer. The water table is at approximately 45 feet below grade. Chlorinated pesticides were used at the site from 1982 to 1984. The release is assumed to be from the accumulation of small spills during on site mixing operations. The impacted soil was located on the property and concentrated in a drainage swale. The pesticides leached from the soil into the ground water forming a plume that was approximately 2,000 feet long and 200 feet wide. Soil source removal was conducted in August 2005 when a total of 1,272 tons of soil were excavated and disposed off-site. Bioremediation was selected to remediate the residual impacted soil and ground water. Petrox bioremediation was applied to the on-property source area and a mid-plume down gradient area. 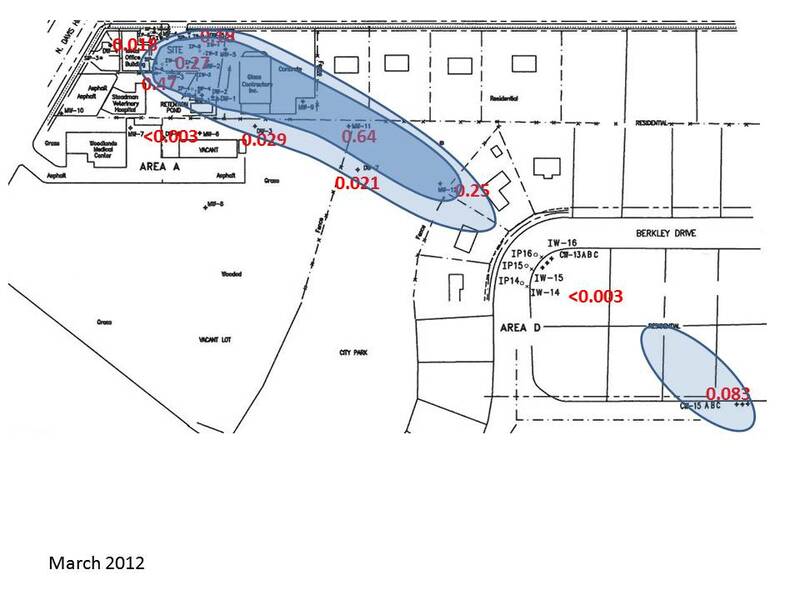 The down gradient plume treatment area was at a set of three injection wells 425 feet from the source area and up gradient from a cluster of monitoring wells. Three full-scale applications of bioaugmentation were completed. 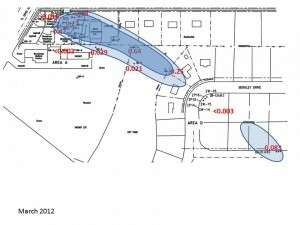 The initial application in November 2011 was 1,540 gallons of Petrox solution injected into soil and 7 seven injection wells in the source area, and 3 mid-plume injection wells near the CW-13 well cluster. The injection in February 2012 was 990 gallons of Petrox solutions in 6 source area wells and 3 down gradient wells near the CW-13 wells. The third injection was 330 gallons of Petrox solution in the same 3 down gradient wells. Following Petrox® bioaugmentation the source area dieldrin concentrations were reduced from a maximum of 9.9 µg/L to 0.47 µg/L. The down gradient treatment reduced the dieldrin concentrations over an area of more than one acre by at least 90%. Overall the size of the plume was reduced by about one half and concentration by 90% in less than one year.